Pie and I have a history. I’m bad at pie. I can bake just about anything on the planet, but for some reason pie gives me trouble. First, it was the crust. No matter what I did my crust would never turn out like the pie crusts I grew up with, flaky yet sturdy enough to keep their shape. My dad has always been the pie baker in the house. He has a signature crust recipe that he always used and it always turns out exactly like you expect pie crust to be: tender and flaky. Me, being as stubborn as I am, would always try different recipes than the one my dad used. I tried the one on the bag of flour . . . it didn’t work. I tried an oil pastry crust recipe . . . it was gross. Even when I tried Alton Brown’s recipe for pie crust it fell apart on me. I was at my wit’s end. When finally, I gave up and called my dad. I asked him to read his recipe to me. Listening to it, I was thinking “That’s it?” It’s so simple and so easy that I refused to believe that it would work. I tried it that day . . . lo and behold, it worked. And it was perfect. It’s now the only pastry crust that I make. As much as I love Alton Brown, my dad makes a much better pie crust . . . This is what it should look like before you add the water. 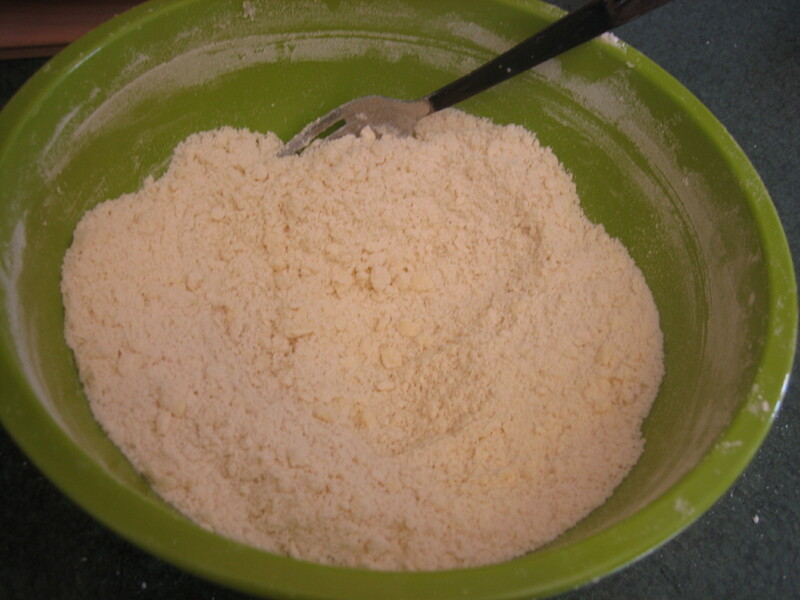 In a large bowl, mix the flour and salt together with a fork or a wire whisk. Using a fork or a pastry blender, cut the shortening into the flour until very well combined. Add ice water and –as my dad says– “stir like hell!” Mix well and knead for 2 or 3 strokes until you can form a nice solid ball in the bowl. Cover this with plastic wrap and put it in the fridge for about 10 minutes while you clean up your work area. Proceed with your pie crust as you normally would. Now, you have several options with your pie crust. You can either roll it out, put it into your pie plate, fill it up, and bake it like that. Or, if you want to fill your crust with something that has to be refrigerated, you can blind bake it . . . which is what I did. 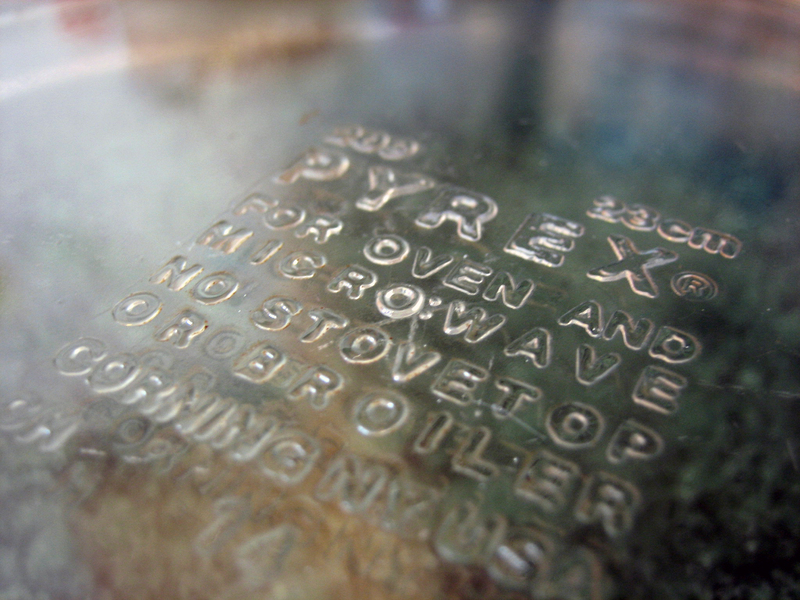 To make a blind baked crust, use the measurements given to make a single crust. Preheat your oven to 425 degrees Fahrenheit. 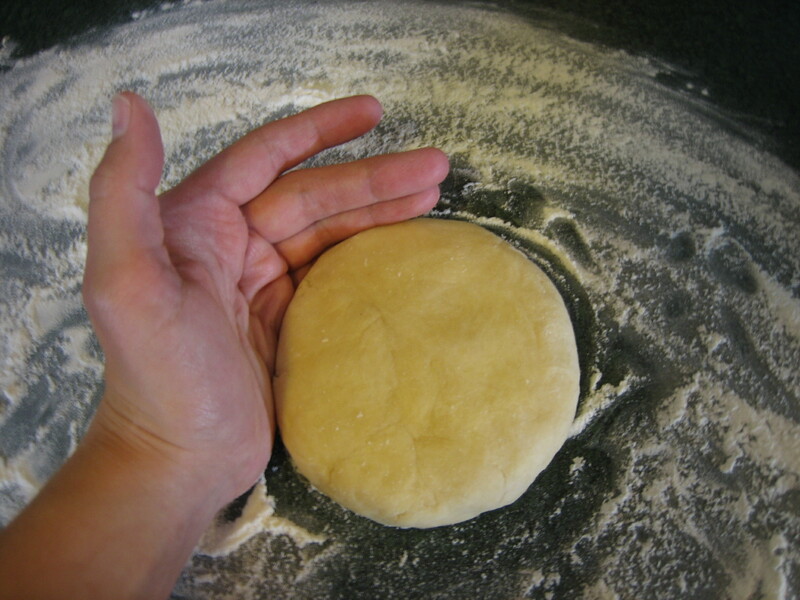 Before you roll out your dough, with your hands form it into a disk that is about 1 inch thick. Then, using a rolling pin, starting from the middle, roll out your dough, always rolling from the middle outwards, until the diameter is about 2 inches larger than that of the pie plate, meaning if you were to place your pie plate on top of your rolled dough upside down, then there would be about one inch of extra pie dough all the way around it. Then, using your rolling pin, roll the crust up on to it and transfer it to the pie plate. Gently press the pie dough down into the pie plate, pushing it to the sides. With a sharp knife, trim off all the extra dough. Now, you want to make it pretty. 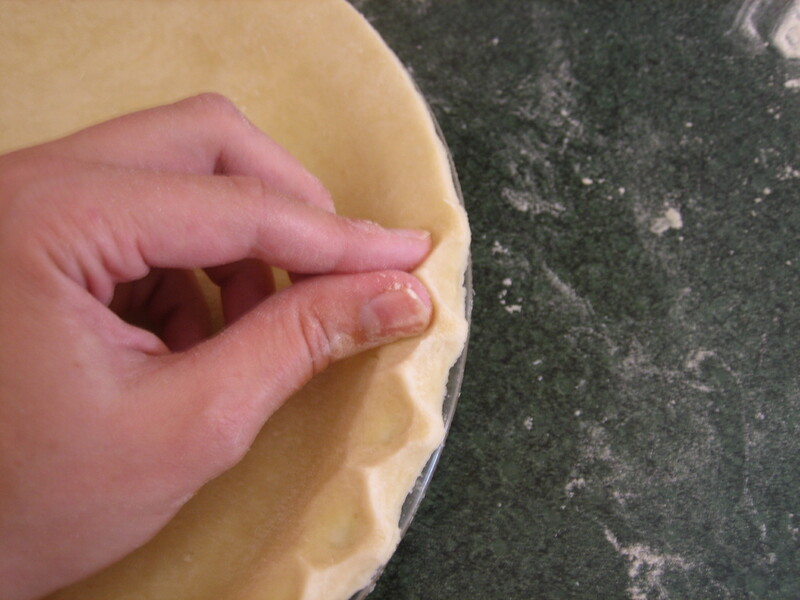 Using your thumb and forefinger of your left hand and the thumb of your right hand, pinch the edge of the crust as shown. It takes a bit to get the hang of it, but really you just pinch with your left hand while using your right thumb to smush it all together. Next, take a sheet of parchment paper a couple inches larger than the pie crust and place it on top. Now, fill your pie with beans! Yep, beans. Any sort of dry beans will work (I don’t think you’ll be able to eat them afterward, so just pick up whatever is cheapest at the store.) Here, I’ve used pinto beans. The beans weigh the pastry down and also keep it from getting all puffy. 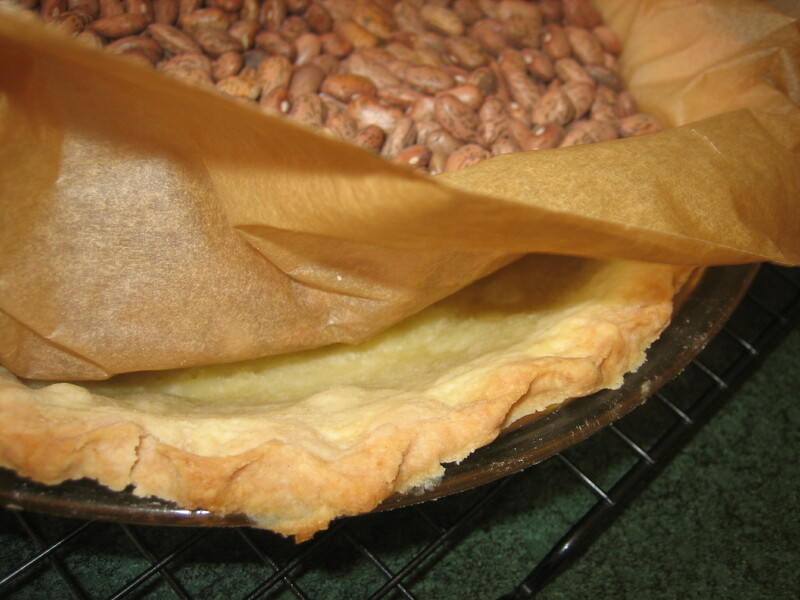 Make sure to push the beans all the way to the edges of the crust and evenly distribute them in your pie dish. Now, it’s time to go in the oven. Bake this at 425 degrees for 15 to 20 minutes. Mine took the full 20. Peek under the parchment to check if it’s done. You want the edges to be a nice, light golden brown and the bottom may look a bit wet, still, but it will look drier and more done as it cools. 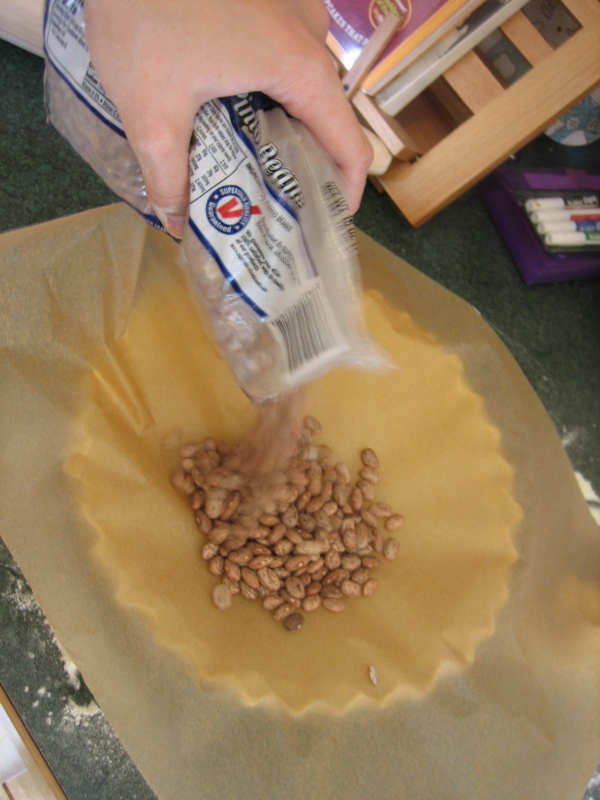 Remove the beans by gently lifting the parchment paper out of the pie plate. Set them aside to cool somewhere, as you can use them for pie weights again. Place the crust on a cooling rack and let it cool completely before you fill it. Now . . . as for the pie I actually made with this crust. I said I’m bad at pie. That hasn’t changed. It’s not that the pie I made was gross or inedible or something, I’m just not happy with the recipe. My idea was to make a pastry cream filling, bury some fresh strawberries in it and cover it with a delicious strawberry glaze. The pastry cream I made tasted good, but the texture was all wrong. I used some tapioca starch and it ended up gelatinous . . . not creamy. And the glaze I put on top of the pie looked great when it was fresh. But after a night in the refrigerator, it has started to separate and look . . . less than appetizing. 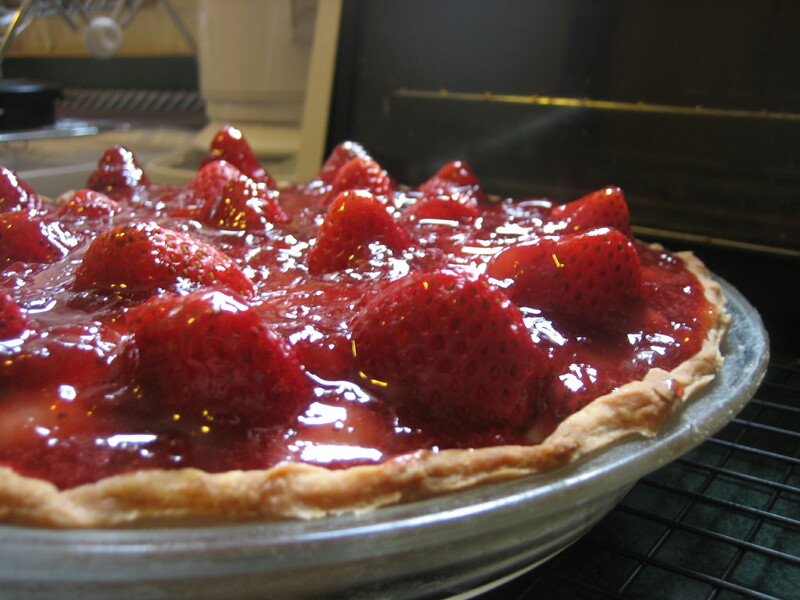 So while my pie tastes great, (actually, it tastes like strawberry ice cream!) the texture is off and it looks ugly. Oh well . . . my pie adventures have not come to an end. There will be another day for pie and me! Allow me to tease you with a photo of pie! Today, I made pie. It’s chilling in the refrigerator right now. I have not taste tested it, nor have I taken photos of a well-presented slice of this creation. However, I wanted to give you a little taste of what you can expect from me in the next few hours. Now . . . time for me to come up with a name for it.